How can a single physical I/O device be virtualized and shared between multiple cloud service consumers? A single I/O device needs to be provided to multiple cloud service consumers, but it has an inherent physical limitation of only being able to service one at a time. The functionality of the physical I/O device is abstracted and its features are presented to multiple cloud service consumers, so that each only sees its own virtualized instance. 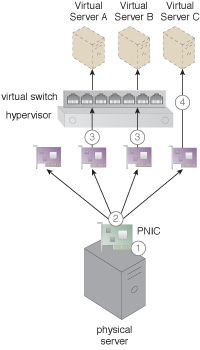 PNIC hardware is used to virtualize the I/O device’s functionality and the abstracted functions are presented via the use of virtualization techniques. A physical NIC card attached to a physical server supports the application of the Single Root I/O Virtualization pattern.